Please note, we close on Wednesdays at 1pm, and do not open at weekends or on public holidays. Please email or 'phone before calling into the shop to avoid a wasted trip. (emails monitored regularly with most being replied to within a couple of hours - if you do not receive a reply within a day, (working days only), please send a new email - some emails simply get lost). Please note this advice as we often hear of emails not arriving. If you get no answer, email again. We mend, service, repair, overhaul audio radio and hi-fi equipment, including vintage radios, mainly from the 50s, 60s, 70s and 80s. In September 2012, Mike Solomons clocked up 45 years professionally repairing hi-fi and audio equipment. Originally under the name Radio and Hi Fi Service, this business became London Sound in 1969, the name was registered in that year and has gone from strength to strength ever since! As a warning to those too feeble to think up a unique name for their businesses, the title London Sound is also our Trade Mark and copyright is claimed. December 19th 2014, London Sound was 45 years old. Also, on January 23rd 2015, we celebrated 25 years at our present freehold high street shop address. 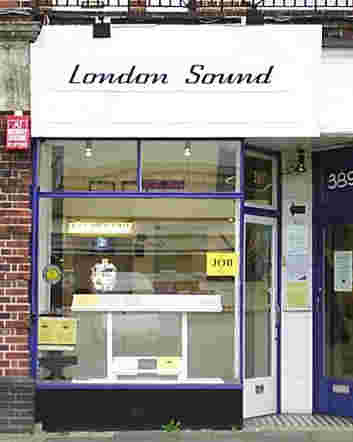 If your equipment sounds wrong - come to London Sound - if we can, we'll mend it! If not we'll advise. We do not sell new equipment, and very rarely sell secondhand, so if we advise you to buy new, there's no profit motive! London Sound was established and registered in December 1969 by Mike Solomons, although the business was founded in 1967. Look down the page to see what we offer, then follow the links to our specialist pages. Pictures of the shop and its owner, Mike Solomons, are also further down this page. For hi-fi repairs, click the brand name of your equipment in the list above or to the left. We are slowly preparing special pages for the main products we deal with. The first ones are for AVI Armstrong, Leak, NEAL, Quad, Radford and Rogers - just click on the name on the left - or in this sentence. We also have a CD repairs link. More will follow soon, starting with A&R and Tandberg. This does not mean we are less happy with other brands, just that we have more information on these brands, even on very early models, in our detailed service data records, making it easier to prepare these special pages. For repair information, click on the brand of your equipment in the list above or on the left. What do we do here at London Sound? We mend, service, repair, overhaul audio and hi-fi equipment. We do not offer "quick fixes", neither are we a dealer or retailer trying to sell you something new. We just put things right, make them work, and if possible, we make them work like new. This can range from vintage wireless receivers from the 1930's, right up to some of the finest of modern hi-fi equipment. We do not normally work on equipment less than twenty five years old as if it is good equipment, but failed that quickly, you can reasonably expect the manufacturers to carry out a free or very inexpensive repair. But if they refuse, please ask us. We happily repair amplifiers, receivers, cassette decks, loudspeakers, record decks, tape recorders, (reel to reel), tuners, tuner-amplifiers, and some other hi-fi, stereo, and even mono items. All repairs are guaranteed for 12 months, in writing, (except for repairs carried out free of charge). Full details of the service are found on the repairs page, but in brief, all of our estimates are free, and we can often give a guide price by email, (londonsound@msn.com), or go to basic details page for more information). Please note, as explained in more detail on the repairs page, the guarantee covers the equipment, not just the repairs carried out - almost the same as buying new! For technical help and advice, please email londonsound@msn.org, or ring Mike Solomons on 020 8868 9222. What makes and kinds of equipment do we handle? The list on the left is not comprehensive, but should give a guide to the main types and brands handled - just look to see if your equipment is listed, and click on the name. Click on any item in the lists at the top of this page, to the left or below, to be transferred to the appropriate "repairs" page. Can't see the brand name of your equipment in the list? We may still be able to help, as often the lesser known brands are of equipment made by well known manufacturers, just with a different badge! Also, we are happy to consider unusual brands and custom built equipment. All that is needed is to email write or 'phone, and we'll be happy to advise, (contact details above). Who runs the service department? My name is Mike Solomons, I have been working in this field for over 45 years, and look forward to being able to help. Solomons, the owner of London Sound. 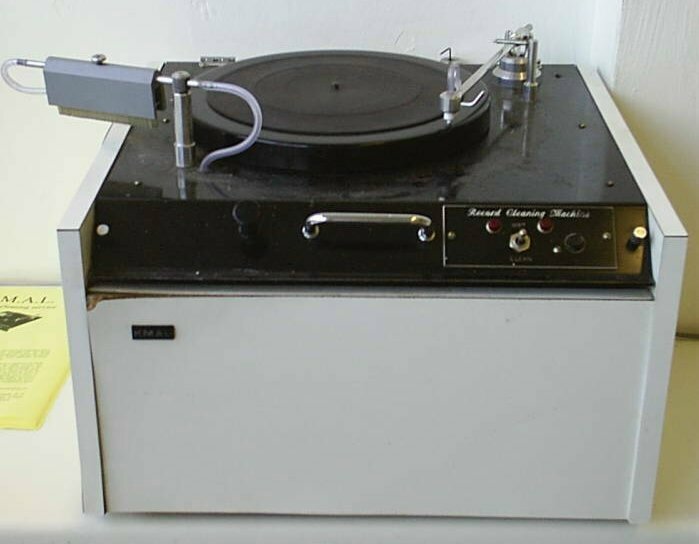 We operate the Keith Monks vinyl record cleaning service using the cleaning machine shown to the right. If you look closely at the photograph, it will become obvious that this is an old machine - we have offered this service, using this machine, since 1975! It has required servicing from time to time, but basically is, in our view, easily the best record cleaning machine available anywhere, at any price! And at this age, what a wonderful testament to the quality of manufacture, especially, if you consider that when London Sound purchased it in 1975 - it was second hand! For further details, visit KMAL vinyl record cleaning, where you will see details of the service, as well as our charges or ring 020 8868 9222. Can't find what you're looking for? Don't worry, it's not a full list - just email us - contact details are at Basic Information, or look first at our "Repairs" page. Also, see if any of the other leaflets, or the correspondence page will help. NO COMPETITION - BELIEVED TO BE THE ONLY HI-FI REPAIRER IN THE COUNTRY OF ITS KIND! For technical help and advice, please ring Mike Solomons on 020 8868 9222. The shop telephone line is normally open Monday to Friday 8.00. am. to 5.00. pm, (excluding early closing on Wednesdays - when we close at 1pm). We do not close for lunch. Please note that the shop door is not usually opened until 10 am. On this site you will get an idea of what we do, here at London Sound. This includes repairing hi-fi equipment, designing and building unusual gadgets, and giving free advice. Please explore the site, from the links above. At present, the site is best navigated by following links, then returning here for the next link. Please feel free to download and copy any of these leaflets, but if you reproduce them, please remember that they are copyright material. However, we are quite happy for any of the leaflets to be reproduced in full, with the only requirement that our copyright is acknowledged, and our full contact details must be reproduced with the material concerned.